Being a member of the Lake Washington chapter is such a valuable connection. You can greatly increase the value of that connection by volunteering. 1) It gives me the chance to get to know other chapter members in a more in-depth way. I am always amazed at the variety of jobs that we all hold, yet at the same time, there are so many similarities in the type of work done by HR across all organizations, whether someone is a one-person HR department or part of a team of 50+ members. Every time I meet a new person, I find that we have shared interests, as well as unique challenges that I can learn from. 2) The opportunity to share my skills and knowledge with others. When I was the volunteer manager for the annual Symposium, my “love” for documenting work processes led me to create a standard process for managing volunteers. I was thrilled to be able to share that with others who might benefit from my experience. Very rewarding! 3) It is totally up to me how much time I spend volunteering. It can be just an hour a month, time spent intermittently to help with a special project or event, a longer-term commitment to serve on a committee, or all of the above! 4) I can choose from a wide variety of volunteering opportunities that fit my skill set or area of interest – from serving as a coach at local colleges to helping students hone their interviewing skills, to helping plan an educational event for the chapter, to being a Table Captain at a chapter meeting. The possibilities are virtually endless! I highly encourage you to join me in volunteering. Visit the Volunteer Opportunities page on the LWHRA website for more information. And be sure to look for the Volunteer Connections table at the next chapter meeting. It’s a great way find out about volunteering opportunities, and to learn about all of the great work being done by the chapter. When you feel included and engaged, do you do a better job? Do teams in which people work well together produce better results? Have you noticed that the best ideas often come from unexpected sources? Do you want to work at the top of your intelligence and give the same opportunity to others? We hope you’ll join us at our next HR and Its Connections SIG meeting, as Fisher Qua of Back Loop Consulting Group will show us how HR professionals can incorporate Liberating Structures (LS) to foster organizational engagement, facilitate meetings that bring high participation and real work in real time, and more. Fisher contributes to the development of the Liberating Structures methodology. He spent five years leading the Washington Health Foundation’s innovation and product development initiatives. His repertoire of inclusive approaches makes it possible to include many people in producing highly desirable solutions. To learn more, please visit the website. Spring is Coming and so is the April Chapter Meeting! Do you have so much on your plate that nothing you’re doing is getting your full attention? Do you have a hard time quieting your mind when needed? Being connected to technology, multi-tasking, and constantly “on” are cutting you off from the most powerful tool you have as a leader: your presence. Through the practice of being fully present in the moment, you can transform your leadership and your life. In this session, find out why thousands of successful business leaders rely on the skill of presence to reduce stress, improve innovation, and ultimately strengthen their bottom line. Why top corporate leaders rely on the practice of presence to give them a competitive advantage. The neuroscience behind our reactions and how the practice of presence gives us access to higher levels of thinking. How leaders at any level can improve their team's effectiveness by bringing attention to the present moment. How to quiet the mind so you can gain access to subtle, yet valuable, information that you may have missed before. Techniques to stay present or come back to presence when you get emotionally triggered. Fast and easy tools that will infuse your culture with the power of presence. Having coached and developed more than 3,500 leaders in six countries since 1998, Sara Harvey Yao specializes in the area of Executive Leadership and Ego. Sara’s clients refer to her as the “Ego Whisperer” and appreciate her precise ability to hone in on the root cause of leadership challenges and quickly resolve them. Companies know any leader working with Sara will gain immense self-awareness, expand their influence and create a more consistent and compelling presence. In fact, Sara’s coaching skills are favored by countless executives from leading companies – among them Microsoft, T-Mobile and Outerwall (formerly Coinstar/Redbox). Whether working one-on-one with clients, as a team facilitator or as an inspiring speaker, Sara is deeply committed to guiding clients to clarity about behaviors, ego tactics and communication styles that hamper conscious leadership. The mission of Girls Can Do is to inspire a generation of “possibility thinkers,” and to encourage young women to have big dreams and pursue them. Girls Can Do hosts low to no cost events in cities around the world. These events provide opportunities for girls and young women to engage, connect, and share experiences with amazing women speakers who are pursuing their dreams -- talking about choices, determination, hardships, failure, resilience and success. Participants get to see the endless possibilities for living a fulfilling life, and know that they can make a difference in the world around them. The Girls Can Do organization also partners with local organizations whose programs provide “next steps” for newly inspired Possibility Thinkers. 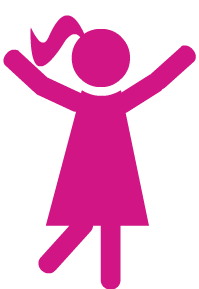 If you would like to support Girls Can Do or one of their partner organizations, please visit their web page. Questions about the new HR certifications being offered through SHRM? Then you should attend the "Certification Lounge". It is free of charge, and open to those who are interested in learning more about the new HR certification. Thursday, April 16, 5:30-8:00pm.